2. Plan ahead - This is one of the most important parts. Do your research! Look at engraving styles and brainstorm ideas, fonts, images and check for any copyrights or trademarks. (A law-abiding engraver legally can not engrave those without permission from the organization. Sorry!) Are you thinking just text? A handwritten message? A photo/logo? The options are almost endless! 3. Request a quote - This part is easy. Click here. Write a short, concise paragraph about what you're planning. Remember to include dimensions and sizing. You can attach a picture of the item being engraved and files if you have them. We will get back with you on a price quote for your project. 4. Allow for production time - Engrave It Houston usually quote 7-10 business days for engraving most items. (click here for same day firearm engraving) If you need things processed sooner, we have expedited services. Another engraving service/company may have different turn around times. You'll have to check directly with them. 5. Prepare Your file for engraving - It is always preferred if you can bring in your own file. Vector format (.ai, .pdf, .cdr etc) or a high res .jpg file will work for engraving best. Having your file prepared ahead of time (if you can) can alleviate and minimize the most common complications and errors that arise with engraving projects. But if you don't have access to design programs (don't worry). You do not have to place everything in the file perfectly. Providing vector artwork of a logo or simply typing up the text that you want to be engraved is sufficient. Someone will be happy to check your file ahead of time if you have any questions. 6. No File? No problem - If you don't have access to a designer or someone who can prepare the file for you do not worry. We have designers that can help you! 7. Spell check, check and triple check - We always send a proof for you to approve before we do any engraving. Why? Because we all can make mistakes. However, you can cut out a lot of the back and forth time spent by simply proofing your own files/info beforehand. Is everyone's name spelled correctly? Is this the most recent version of the logo that you want to use? 8. Pictures speak greater clarity than words - Even if your drawing skills look like a grade school kid got their hands on some markers... if you have a layout in mind or something specific that is better communicated with pictures rather than a long paragraph, please provide your engraver with this information. - Not everyone can be Da Vinci, we get that and will totally not judge you for trying to clarify. 9. Allow for production time - Check to see what production times are BEFORE you bring your items in so you can plan accordingly. If you need things last minute (like... need it yesterday? ), be prepared to pay a premium rush fee to move your order up in front of all the other orders waiting in line. 10. Leave the details to your engraver - Not sure what type of laser you need for your project? Is an engraver going to have the right equipment to handle your specific needs? Should you look at paint filling for higher contrast? There are a lot of questions that your engraver will already know the answers to, and you do not need to worry about. Submit a request for a price quote online or give your engraver a call to briefly explain your needs. He/She will know how to direct you from there. 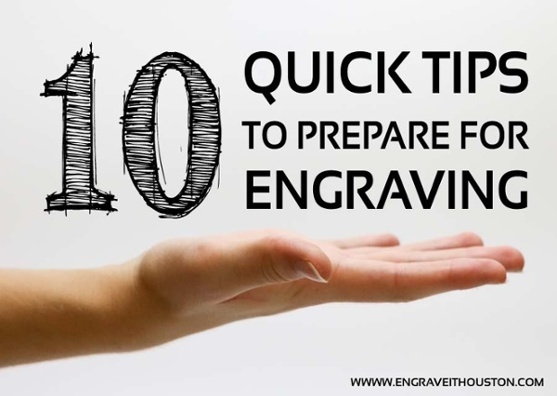 With these tips, you should be able to walk in to drop off your engraving feeling super confident, knowledgeable and prepared. If you have any other questions, feel free to contact us. Engrave It Houston is here for you, and we're happy to help!